Department of PG Studies and Research in Biotechnology, Kuvempu University, Shankaraghatta 577 451, Shivamogga, Karnataka, INDIA. Background: Litsea glutinosa (Lauraceae) stem bark is widely used in folk medicine as a hepatoprotective, anti-diarrheal and anti-dysenteric drug but there is a lack of information about its toxicity. Objective: To evaluate cytotoxicity and acute toxicity of the stem bark ethanol extract (BEE). Materials and Methods: In vitro cytotoxicity of BEE was measured against breast adenocarcinoma, prostate, and colon carcinoma cell lines. In the acute toxicity tests, rats received oral doses of BEE as 1000, 2000, and 3000 mg/kg body weight. Mortality, signs of toxicity, body weight, food consumption, and gross findings were observed for 14 days. Blood samples were collected from anesthetized animals and used for hematological and biochemical parameters. Histopathological study was performed using liver and kidney samples. Results: The BEE does not show significant cytotoxic effect against the tested cell lines up to the range from 5 to 320 μg/ml. In acute toxicity study, also lethality was not observed up to 3000 mg/kg b.w. No significant differences were noticed in body and organ weights and histopathology examinations between the control and treated groups. Conclusion: This study authenticates stem BEE may contain bioactive compounds of potential therapeutic significance which are relatively safe from toxic effects, and evidences the medicinal use of this plant in folk medicine. Sumithregowda AH, Venkatarangaiah K, Honnenahally KM, Manjunath VN. 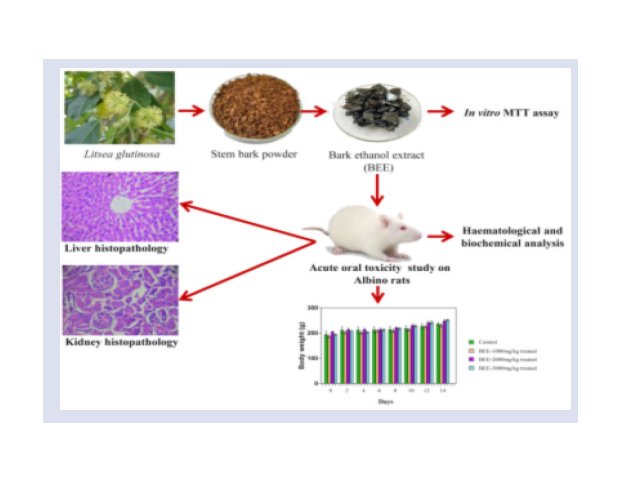 Cytotoxicity and Oral Acute Toxicity Studies of Litsea glutinosa C. B (ROB) Stem Bark Ethanol Extract. Pharmacognosy Journal. 2017;9(6):880-886.